I’m a big believer that food should be fun, for adults as well as for kids. Which is why, when I saw the recipe for the delightful dessert pictured above in a new cookbook my darling wife S had just purchased, I knew I had to make it. The book, which I urge all of you to buy (for two reasons), is called Off Duty, the world’s greatest chefs cook at home. Not only is this book filled with great profiles of and recipes by 48 terrific cooks like Thomas Keller, Charlie Trotter, Raymond Blanc, Nobu Matsuhisa, and several generations of the Roux family, proceeds from this book go to The Nicholls Spinal Injury Foundation. The Nicholls Spinal Injury Foundation was started by chef David Nicholls after his son was left paralyzed following a swimming accident. It’s mission is to fund research to cure spinal injury. One of the chefs featured in Off Duty is Michel Richard, considered a pioneer in Franco-Californian cooking. I’ve owned Richard’s book Home Cooking with a French Accent for years and have always treasured it. Understandably, I was excited to discover some new recipes by this talented chef. The first two recipes in his section are Salmon Rillettes and Aubergine with Scallops and Goat’s Cheese. But it was his third recipe, for Egg Soufflé, that had me jumping up and down like Cruise on Oprah. This is a great dessert. Looking at it puts a smile on my face. It’s fun, delicious and easy to make. It’s so very surprisingly easy to make. Which was one of the reasons why I was so taken with it and so astounded that it worked as well as it did. You see, the only cooking that is required is done in the microwave… yup, you read correctly, the microwave. Essentially, the dessert, served in an egg shell, is two layers of meringue with a surprise “yolk” filling made of lemon curd. The top of the soufflé is blowtorched briefly, giving it a lovely browned color while also puffing up the meringue. S and I hosted some friends for dinner last Saturday. We served these gorgeous and humorous little soufflés, accompanied with a scoop of homemade Almond Roca ice cream, for dessert. Using an egg cutter, cut the tops off the eggs. Discard the tops and separate the yolks and whites of 4 eggs. Reserve the remaining 4 eggs. Make the lemon curd by placing the 4 egg yolks, lemon juice, butter and 100g of sugar in a microwave safe bowl. Microwave the mixture for 5 minutes, pulling the bowl out to whisk every minute. Cover with cling film and leave to cool. The curd will thicken as it cools. Place in the fridge for at least 6 hours. This can be made a day in advance. To prepare, whisk the egg whites, adding half the remaining sugar little by little, until they form soft peaks. Fold in the remaining sugar with a spatula. Place the eggshells in egg cups. Put the meringue in a piping bag and fill half of each shell with meringue. Put the lemon curd in another bag and pipe a teaspoonful into each shell. Then add more meringue on top to make it look like a soufflé. Place the eggs in the microwave for 5 seconds right before serving. If you own a blowtorch, quickly brown the tops of the soufflés; if not, use a hot broiler and broil the soufflés for a few seconds. Note: you can actually replace the lemon curd with other ingredients. I’ve made these with chocolate and they’re equally delicious. In addition to the egg soufflés and ice cream, we prepared 3 savory courses. For a first course, I made some crispy sweetbreads with curry sauce, plated over some risotto à la Milanese. For a second course, S made a lovely steamed ocean threadfin with ginger and spring onions. She got the recipe from a book she’s just helped finish editing. The book is being produced by uber-kitchen manufacturer Miele and is a compendium of steamed food recipes, as contributed by 8 big-name Asia regional chefs. This threadfin recipe was created by Justin Quek, chef-owner of La Petite Cuisine in Taipei. Our last main course combined two of my favorite foods, braised pork belly and macaroni and cheese. S made the pork following a recipe from Tom Colicchio’s Think Like a Chef. I made the mac & cheese. The pasta was cooked in a simmering combination of milk and water that had been flavored with a bay leaf and some salt. It was then tossed in a sauce made from reduced chicken stock, a little of the milk poaching liquid, some reblochon, parmesan, and a generous portion of Tetsuya’s truffle salsa. Each portion of the pasta was placed in a ramekin, topped with more parmesan and then grilled under a hot broiler for a few seconds. Not exactly the mac & cheese of childhood memories, but it’s something that I think references our youth well while appeasing our more adult tastebuds. What lovely pictures! You mention your wife S’s ice-creams a lot in your blogs. Where does S get her recipes from? I am so tempted to get an ice-cream maker now! 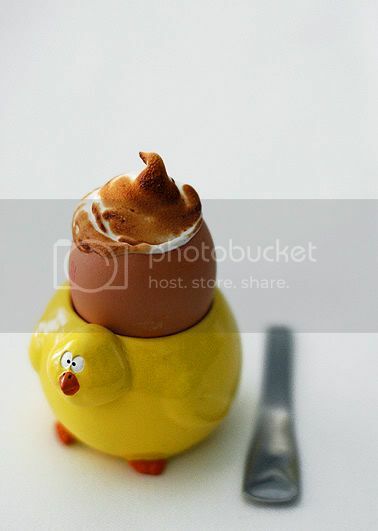 This egg soufflé is cute and, as usual, the pictures are beautiful. Yes, fun is also for adults! too cute! the souffle bit reminds me of the tuft of hair that you see on cartoon charaters and I can just imagine drawing a face on the egg. That is just the cutest lil thing! I love it. I feel like a kid all over again just coveting a bite! Too cute! You made me want to go out and buy the cookbook… S, indeed I am a fan of Baking Illustrated. It’s fab for dumbos like me — yet I still managed to screw up on one or two recipes. Do you think these can be made without a microwave? lol! this picture made me laugh! the expression of the cicken is great! 🙂 well done. Ooohh! The souffle in the egg cups is adorable! I love the humor and cheer of this post! The first photo made me grin like an idiot -and yes, how perfect it would be for Easter! How I love soufflés, and how I adore the fact that you’ve treated them with charm rather then the all-too often rareified air of complexity. Hi – just stopping by. The recipe sounds really easy but, maybe I’m reading too quickly. Where does the 40g of unsalted butter come into play? I like your more advanced version of macaroni & cheese! 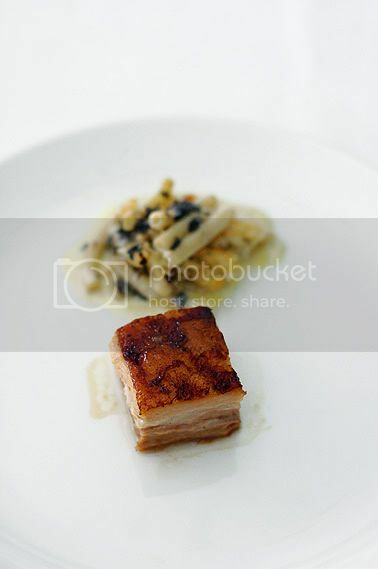 The porkbelly looks very perfectly done too. Just a noob question that’s probably been answered before.. where can you get that truffle salsa in Singapore? I’ve got the book in my shopping cart at amazon for some time now, but wanted to see what it’s got in the book. Glad to read your post now and I’m definitely getting a copy for myself. Thanks! And the whole dinner you hosted sounds utterly good, and the souffle of course is super cute! Thanks for trying to remember – the egg cups are SO cute – as I don’t think I will be able to find them, would you mind if I use the picture on our desktop instead? If you love eggs soufflé, i’ve justed posted on my blog a great recipe from the french chef Jean-François Piège, give it a try! Ohhh so cute. I wanna eat! Love meringue. Honestly, someimes I jux wish I am still a kid cux the kids meal looks more appertizing. Moreover, it suits me purrrfectly, as it has variety. And since I a full portion is too much for me to stomach hence a piece of each suits me well. S’mee: Hope they work for you and the little guy. Thanks for the tag. I’ll get to it soon. Maia: She uses quite a few different cookbooks. She doesn’t have one single favorite. Cin: One friend said they look like Tin-tin. Annette: You should definitely get the book. Tons of good recipes and it helps a good cause. Kristie: Not sure. Probably. But the beauty of the microwave is the speed. Fiordizucca: Thanks. I’ve had these egg cups for years. It’s great to finally find a dish that works well with them. Tara: Hi! How are you? How’s the baby? Thanks for dropping by. Yah, I loved that this dish treats a usually complex dessert with such simplicity. Chika: Hiya, it’s a good book. Really recommend it. Thanks for dropping by. Ooishigal: Cool. I’ll check it out. Cin: I love looking at kids’ menus. If you ever fly SQ business class, ask for the kids’ menu. S wrote all the copy for it. It’s an adorable and delicious sounding menu. Frozen Desserts by Caroline Liddell & Robin Weir is a good place to start. They have great ideas for adding ingredients into the churned ice cream and instructions for infusing the cream/milk. I kind of use their ideas and apply them to my favourite custard base recipe because I prefer ice creams made with a custard base. Other recipes I like come from Gordon Ramsay’s Just Desserts, Sherry Yard’s The Secrets of Baking, Artisanal Cooking by Terrance Brennan and Andrew Friedman (there’re a whole lot more). And my favourite chocolate gelato recipe comes from Traveler’s Lunchbox. The little Phillips ice cream machines that you have to freeze before you use seem to be pretty good alternatives to the Musso. (Honestly, unless you make lots of ice cream, you don’t really need a machine.) I know a restaurant chef you used to use the Phillips one in his kitchen for small batches. I am a sucker for rich ice creams, so I’ve rarely tried healthy alternatives. But you’ll discover that homemade sorbets made from fruits that are in season are infinitely tastier than store bought ones (the first book I listed also has lovely sorbet recipes). I’ve also seen tofu-based recipes. If your hubby loves ice cream, it might be worth your while to try out recipes that are less taxing on his cholesterol rather than denying him of ice cream altogether. You are such a dear, S! 🙂 Thanks so much for your tip. I will go check out the books soon. By the way, we have been buying these really good ice-cream from The Daily Scoop at the Clementi Arcade. We love its cempedek, and I heard the lychee martini is good too. Thanks, Maia! Yes, I’ve been hearing good things about The Daily Scoop. Must go check it out soon. These are too adorable! I can’t wait to suprise my little ones with them for Easter. You haven’t posted for 5 days! I miss you! ah, an egg cutter. I knew I forgot to buy something! and that’s just about the cutest egg cup I’ve ever seen! So you fold in the other half of the sugar instead of beating it in? I wonder if that’s because you’re microwaving it instead of baking. I love your site & the title is GREAT! I can not wait to make this little souffle dish ….. where did you get the chick dishes???? Love them!!!! Thanks 🙂 Um, CH bought those egg cups a day before our wedding in Perth many years ago.